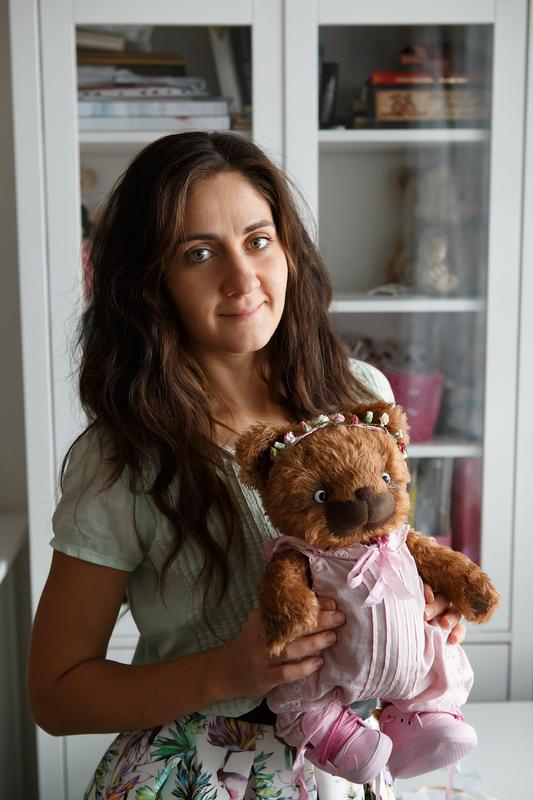 Hello, my name is Marina Kachan and Teddyroom is a great part of my life. I work as a teddy bear artist for 7 years. My first profession was an engineer at a power supply company. I began to create teddy bears when a company in which I worked was closed and I was left with no job. My first bear living with my mom. Now my teddy bears live around the world. Once I had a custom job to make wedding teddy bears (the bride and groom). It was very interesting to choose their costumes, creating a bouquet of flowers and other wedding details. I created them with great pleasure. After a while the newlyweds found me and asked to make one more baby teddy bear. My family helps me in everything. My husband makes beautiful pictures and is the technical support. My daughter Sofia does the hugging of the bears. She is two years old. Handmade has given me the ability to stay home with my daughter throughout her childhood which is very important to me. I can plan my working day as I want. Also bears give me a great opportunity to travel. I am independent of the office, and I can live in different countries and create my teddy bears there. My Bears are made in accordance with Teddy technology by master pattern developed by me, one of a kind. I use only the highest-quality materials, as Schulte, Helmbold Mohair, Viscose, glass eyes specially for teddy bears. They are at least five way jointed. I create them with a great deal of love, so each of them has a part of my heart. I can not stop in the creation of Teddy bears. I constantly improve the patterns and processes of creation. My dream is always to make my bears and to have a big workroom. I love all of my bears, and I know that they are in love in their new homes. I think If you love what you do you will succeed. Teddy bears are not toys. They are our friends and partners that follow with us through our life, reminiscent of the joyful event and support in difficult times. Many thanks for the interest in my teddy bears. Marina Kachan and my Teddy bears.